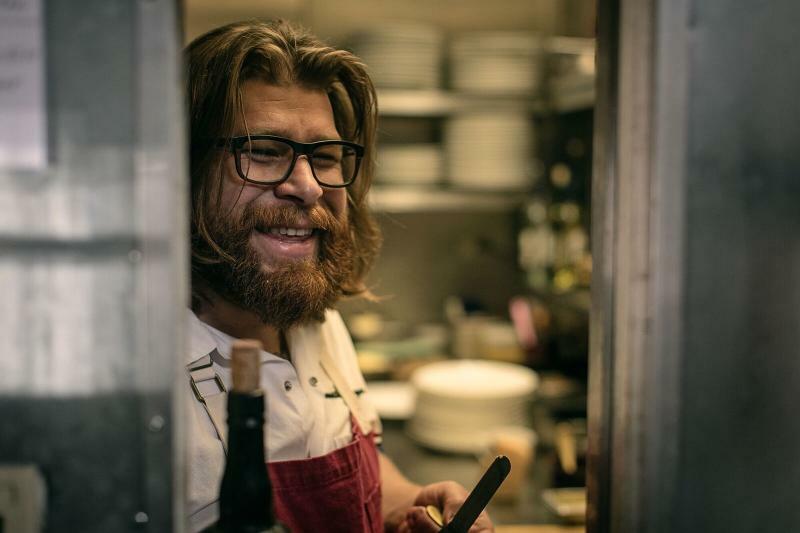 Few chefs have helped put Cleveland in the limelight like Jonathon Sawyer. Now, it's time to follow his lead and see what the fuss is all about. The media's current take on Cleveland goes something like this: The Rust Belt city, after suffering through decades of post-industrial decline and misery, is enjoying a glorious rebirth, making it identifiable with more than just LeBron James and well-done Ikea jokes. While that's not entirely wrong, it misses the bigger attitude found among the natives in "New Cleveland": Let's f*cking create. Greenhouse Tavern chef Jonathon Sawyer seconds that sense of hope about Cleveland's future, despite its historical hurdles: "Yes, the Cuyahoga River caught on fire—but we got over it," Sawyer says. "And you should, too." In terms of people putting on for their cities, Sawyer is at Otto Graham levels as a surrogate for Cleveland. After moving home following a successful career in NYC kitchens, Sawyer started his own mini-empire. His efforts at Greenhouse Tavern, Noodlecat, and Trentina not only snagged him a James Beard Award, but they also helped draw food media's attention back to the Midwest. Talk to Sawyer about his hometown and you'll immediately pick up on his excitement, whether he's recommending Ohio City breweries, or restaurants in the Chagrin Valley. But he's also a fountain of knowledge when it comes to activities outside of the kitchen. "There are few things better than taking my scooter along the Emerald Necklace with the river right behind me," Sawyer says. "It reminds me why I'm living, you know?" To get a pulse on the city, we turned to Sawyer for tips on how to properly pre-game for a Cavs game, and where to find the best Indian food. Here are Jonathon Sawyer's 10 commandments to eating and drinking in Cleveland. 1. Go apple picking and visit a landmark castle. Sawyer says: "First of all, this is great just for getting out there to see the beauty of the state. But it also allows you to take in the pear and the fruit farms of northeast Ohio. Head to Patterson's because they will have a mini-festival for every season, with strawberry, pumpkin and corn. Patterson's is in the heart of the Chagrin Valley, so after you're done picking apples—and showing your kids where fruit comes from—you can head to Squire's Castle (3037 Som Center Rd, Willoughby Hills; 440-473-3370), which is this great quirky piece of architecture nearby. With my daughter and son, we're good for this little day trip once, if not twice, a month." 2. The city's spiciest Indian food is fire—figuratively and literally. Sawyer says: "Typically, we'll take along some Indian food from Taste of Kerala (5850 Mayfield Rd, Mayfield Heights; 440-461-9212) whenever we head out to Patterson's. There’s a lot of average Indian food in Cleveland, but this is the only real homespun southern-style Indian fare. It’s run by a family, and often times when you go there you’re talking to the brother or father. There are no tables or chairs—it’s just a pick-up counter. It was one of the first places where I got Indian food where they asked me 'how hot?' when I told them I wanted spicy food. When I told them I wanted it 'Indian hot,' I felt like I was accepted by them at that point. They were like, 'We’ll offer you the option of hot now, because we’ve seen you enough.' It was the greatest thing." Sawyer says: "Since the Cuyahoga River (a.k.a., the inception point of the EPA) caught on fire, it has become a place of solace for Northeast Ohio. Any day of the week you can find crew teams racing down the old Cuyahoga, cyclist and families riding down the Towpath, kids in the skate park next to the river, and people of all ages enjoying restaurants like Merwin's Wharf, or having a locally brewed beer at Brick and Barrel (1844 Columbus Rd, 216-331-3308)." 4. Cleveland's Asiatown has it all—including karaoke. Sawyer says: "For Korean, you have to head to Miega (3820 Superior Ave, 216-432-9200). It's right above Asiatown Plaza. My favorite Vietnamese is Superior Pho (3030 Superior Ave #105, 216-781-7462). The owner and his son are amazing Clevelanders. When it comes to grabbing Chinese, there's an excellent melt-your-face-off spicy dinner at Szechuan Gourmet (1735 E 36th St, 216-881-9688). Recently, my wife and I had a date night there, ate some killer chilled cucumber and beef tendon in chili Szechuan oil, and checked out The Crucible at Outcalt Theatre (1501 Euclid Ave #200, 216-241-6000). If you like chilies and heat, the Szechuan stuff they do there is bone-numbing. They also have two karaoke rooms there, and they're, like, $110, but you can fit about eight people in there and it includes the food. It's a no-brainer." 5. In Ohio City, do your best to dodge the tourists. Sawyer says: "That is, unless you want to get grinded on or blackout drunk. For me it’s cool to see that classic neighborhood on a Friday or Saturday morning. You hit the market, go pick up a few things, you eat the whole way, and then you do a couple of breweries. But the neighborhood is getting bigger and bigger, so it’s almost becoming a tourist attraction because the Detroit-Shoreway is right around the corner, and Lorain [Avenue], as you're going down, is burgeoning as well. So I find myself still going there to explore more and more, even though our old restaurant Bar Cento (West Side Market, 1948 W 25th St; 216-274-1010), which we opened up eight years ago, was the first modern restaurant there outside Great Lakes Brewery (2516 Market Ave, 216-771-4404)​. Even when I was younger in Ohio City, before it became all bars, I would go out during the weekend. It’s just now transitioning to become something resembling the Meatpacking—but there’s nothing wrong with that." 6. Instead, explore the “sacred grounds” of Cleveland Heights. Sawyer says: "We live in Cleveland Heights, and as teenagers it was a sacred place for us. We could go play hacky sack in the park, have lunch at Tommy's (1824 Coventry Rd, Cleveland Heights; 216-321-7757), hit up City Buddah (1807 Coventry Rd, Cleveland Heights; 216-397-5862) to up our incense game, or check out a raging show at [music venue and bar] Grog Shop (2785 Euclid Heights Blvd, 216-321-5588). Now with the kids, I find myself walking to Coventry Village in the summer for their Friday night movies in the park, stopping in for some old-school American Chinese food at Hunan Coventry (1800 Coventry Rd, 216-371-0777) first, and then popping down to Picadilly (1767 Coventry Rd, 216-321-7422) after the movie for their killer vegan coconut yogurt." 7. There's an explosion of breweries; treat yourself with a beer. Sawyer says: "They’re everywhere. There’s a place called The Butcher & The Brewer (2043 E 4th St​, 216-331-0805); there's Platform Beer Co. (4125 Lorain Ave​, 216-202-1386), which is really good and new; there’s Market Garden Brewery (1947 W 25th St, 216-621-4000)​, Nano Brewery (1859 W 25th St​, 216-862-6631), and Fat Heads (24581 Lorain Rd, North Olmsted, OH​, 440-801-1001). The list goes on and on. You'll find good stuff no matter where you go." Sawyer says: "For me, when I speak about 'New Cleveland,' it's all about embracing a positive future. The Cleveland Flea (3615 Superior Ave​) and Night Market Cleveland (Rockwell Ave)​ are a true showing of what is making Cleveland a super-cool comeback city. At the Flea, you won’t see those people anywhere else. They are all hobbyists sharing sewing machines or other goods. It’s a really inspiring place to be. Even if you don’t buy anything there, it’s great to see people who are young, positive, and motivated all in the same place." 9. Know how to navigate downtown during a Cavs game. Sawyer says: "I think the best way to experience the NBA Playoffs is to get downtown early. I totally believe 4th Street is the epicenter of downtown during sports. But when you're talking about certain days, like one recently, where you've got a Playoff game, an Indians game, and a sold-out concert at the House of Blues, you could have 100,000 people downtown just for those three things, and all of them want to be at the same spots. So make a reservation early at your restaurant of choice in the neighborhood—whether that's a place like Mabel's BBQ (2050 E 4th St​, 216-417-8823) or Greenhouse Tavern (2038 E 4th St​, 216-443-0511)—and go early to see the streets fill up. It's one of the most exciting parts about being down there." 10. Find a bike trail in the Cuyahoga Valley. Sawyer says: "The cycling scene in Cleveland is pretty great. Although still not as bike-friendly as somewhere like Denver or Seattle, we find ourselves on our bikes a lot in the city and in the Cuyahoga Valley. My favorite day trip is biking the Towpath with my family. We start up in downtown Cleveland and ride all the way down to Peninsula (over 30 miles). We hit the farmers' market in the Valley or at Old Trail School in the winter, and we always always always stop for a beer and popcorn at Winking Lizard (1852 Coventry Rd, 216-397-8380). The Lizard has over 400 beers—many of them are extremely rare." Page 1. Go apple picking and visit a landmark castle. Page 3. Cruise the Cuyahoga.